Jesse Bell is the most professional, easy-going contractor we have worked with. His work is impeccable, and his team doesn't miss a detail. He honors his commitments and sticks to a reasonable schedule. He partners with quality professionals to provide services and only uses people he can trust. He has now completed three major projects for us, and we are just about to have him quote a fourth. I will never use another group if I don't have to. 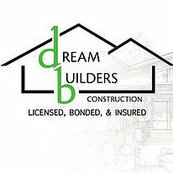 Jesse and Dream Builders Construction has my support 10,000%! !